The fire erupted about 6:30 p.m. local time. Authorities said the cause was not certain, but that it could be linked to renovation work that the cathedral was undergoing, the BBC reported. Officials ordered an evacuation of the area around the 850-year-old cathedral that has withstood world wars and political turmoil throughout France's history. Le Monde, a Paris daily newspaper, reported that the fire erupted in the attic of the cathedral. Televised images showed the church's iconic steeple was ablaze. In 2018, the Catholic Church in the Archdiocese of Paris opened an urgent fundraising appeal to save the cathedral, which was starting to crumble. The Associated Press reported that Paris Mayor Anne Hidalgo said about an hour after the fire started that firefighters were attempting to contain a "terrible fire" at the cathedral. An AP reporter at the scene said the roof at the back behind the cathedral, behind the nave, was in flames and yellow-brown smoke and ash filled the sky. City officials cordoned off the area around the Gothic-style church and urged people to evacuate the immediate surroundings. As the sun set over Paris, the fire consumed the upper portion of the cathedral and the main steeple was filled with flames. It eventually collapsed into the church. "Everything is burning. The framing, which dates from the 19th century on one side and the 13th on the other, there will be nothing left," Andre Finot, a spokesman for the cathedral, told Agence France-Presse. At one point, emergency responders entered the cathedral in an attempt to preserve priceless art and statues from destruction. The blaze elicited emotional responses from throughout France as Christians began the observance of Holy Week. "I had a scream of horror. I was ordained in this cathedral," Bishop Eric Moulin-Beaufort of Reims, president of the French bishops' conference, said in reaction to the disaster. "For a Parisian, our lady is a kind of obvious," he said. "I've been here this afternoon. This tragedy reminds us that nothing on this earth is made to last forever. I think a lot about the Diocese of Paris. The chrism mass will not be celebrated. It is a part of our flesh that is damaged. But I hope this will create a new momentum, a universal movement." French President Emmanuel Macron tweeted, "Our Lady of Paris in flames. It is emotional for a whole nation. Thoughts for all Catholics and for all French. Like all our countrymen, I'm sad tonight to see this part of us burn." The magnitude of the fire resonated with church leaders as well as those involved in preserving culturally important sites around the world. The Vatican issued a statement in the evening saying that it learned "with shock and sadness the news of the terrible fire that has devastated the Cathedral of Notre Dame de Paris, symbol of Christianity, in France and in the world." "We express our closeness to the French Catholic and to the people of Paris. We pray for the firefighters and for all those who are doing everything possible to face this dramatic situation," the statement said. “The horrific fire that is engulfing the Cathedral of Notre-Dame de Paris is shocking and saddens us all, for this particular cathedral is not only a majestic church, it is also a world treasure," said Cardinal Daniel N. DiNardo of Galveston-Houston, president of the U.S. Conference of Catholic Bishops. "Noble in architecture and art, it has long been a symbol of the transcendent human spirit as well as our longing for God," the cardinal said in a statement April 15. "Our hearts go out to the archbishop and the people of Paris, and we pray for all the people of France, entrusting all to the prayers and intercession of the Mother of God, especially the firefighters battling the fire. 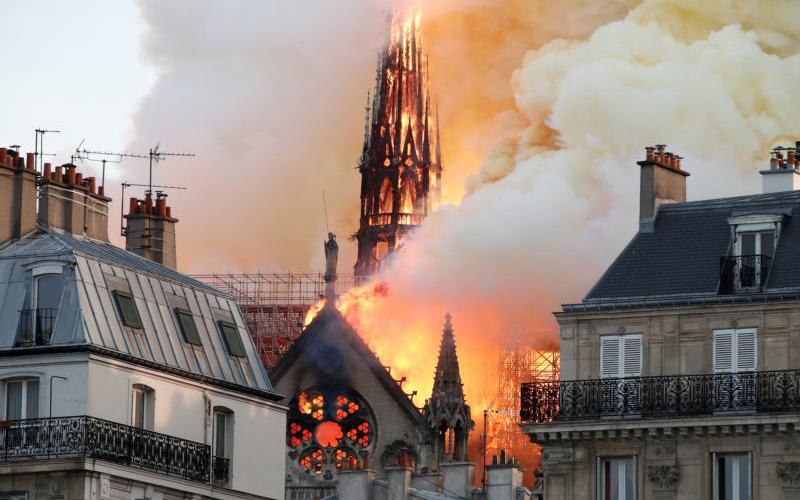 "We are a people of hope and of the resurrection, and as devastating as this fire is, I know that the faith and love embodied by this magnificent cathedral will grow stronger in the hearts of all Christians," he added. Cardinal Timothy M. Dolan of New York, said in a statement from the archdiocese that he immediately went to St. Patrick Cathedral next to his office in midtown Manhattan and asked through "the intercession of Notre Dame, our Lady, for the cathedral at the heart of Paris, and of civilization, now in flames!" "God preserve this splendid house of prayer, and protect those battling the blaze," he said he prayed. Audrey Azoulay, director general of UNESCO, the United Nation's cultural agency, said in a tweet that her office "stood at France's side to save and restore" the cathedral, which was added the organization's world heritage list in 1991. She described the cathedral as "a priceless heritage" and that the agency was monitoring the effort to fight the blaze. In addition, the Diocese of Rome tweeted, "We are close to our brothers and sisters of the Church of #France, to the ecclesial community and to all Parisians. United, let us pray to the Virgin Mary, revered to #NotreDame, as mother of hope and all consolations." U.S. President Donald Trump also expressed concern for the cathedral in a tweet, writing, "So horrible to watch the massive fire at Notre Dame Cathedral in Paris." He even offered a suggestion on how first responders could tackle it: "Perhaps flying water tankers could be used to put it out. Must act quickly!"